If you think you need to shelve your dream travel plans until your kids are old enough to a) behave their adorable selves or b) stay home happily without you as you trip about the globe then… think again! You don’t have to hang up your frequent flyer points when your baby arrives, but it’s a good idea to simplify your itinerary and give yourself plenty of room and time to move. Avoid booking those stressful early morning flight times which means you’re up at 4am, or the late night red-eye specials that can leave everyone frazzled and grumpy on arrival. If you’re hitting the road, try to steer clear of peak hour traffic and prepare to break your journey up with lots of stops so bub isn’t strapped in for hours on end. 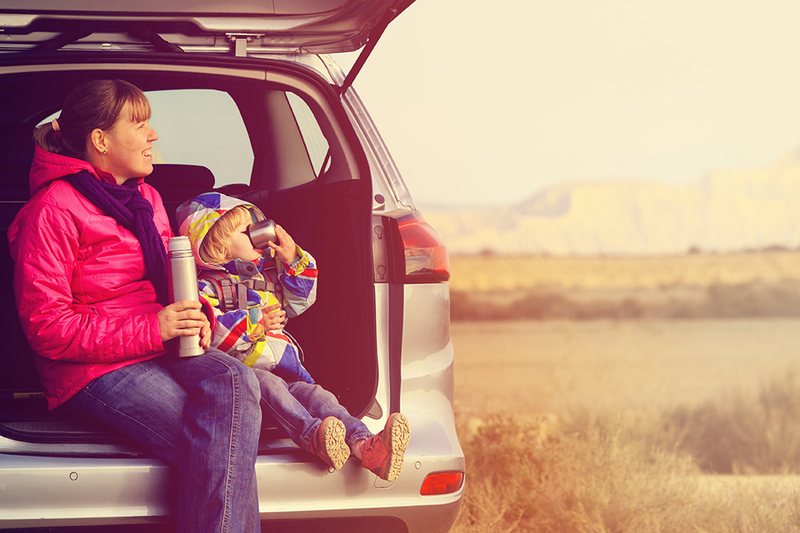 Holidaying with kids is a world away from your pre-baby jaunts, but there’s a lot of helpful kit out there to make the ride smoother. These could include in-flight cushions for the kids, a handy port-a-cot or our favourite, the Ergobaby Omni 360 Cool-Air Mesh carrier. It features a lightweight design to keep your child comfortable, and most importantly, leaves your hands free to carry luggage, juggle travel documents or your phone. It also means when your little one is exhausted or overstimulated, they can snuggle up and doze off wherever you are. Wherever you’re planning on going, other parents have been there before you and are ready to share their advice. Big review sites like Trip Advisor are a brilliant place to get intel on handy hacks, locals’ tips and great deals to make your trip a great success. Travelling with a child makes you more intrepid – automatically – from the get-go. Embrace this curious and roving mindset and apply it to your holiday days. 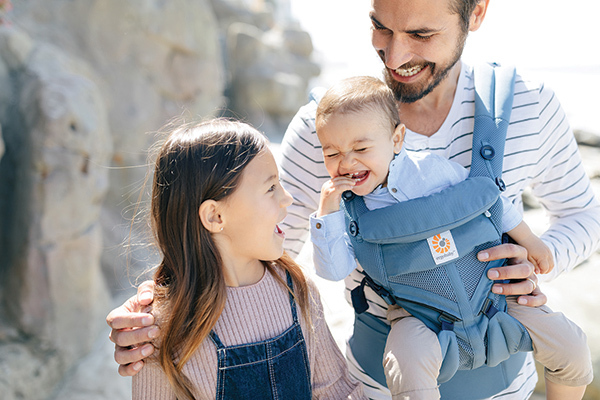 Being adventurous is even easier with a baby carrier. You can get off the beaten track and explore tourist walks and beaches where a pram cannot go, without worrying about stairs, sand or rocky paths. Public transport is also easier to navigate without packing and unpacking strollers or trying to balance kids and bags all at once. The brilliant thing about travel is that you learn to expect the unexpected – and quickly discover how to cope when things don’t roll out the way you’d planned. If you’re taking your baby on your holiday, keep an open mind, make any adjustments to your plans with minimum fuss and trust the universe will take care of the rest. It won’t be like the old days pre-baby, but know that it can be even better if you approach it with a can-do attitude and face any contingencies with good humour. Family trips are even more fun if you can identify known stress points beforehand and plan ahead to sidestep them. Obvious ones like checking in at the airport or stumbling through customs with bags, babies and boarding passes can be tough, but there are smart ways to lighten the load. 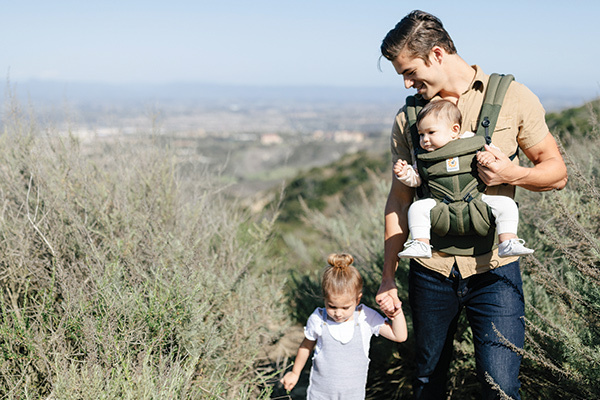 Using a carrier, for example, keeps bub snug and secure and makes you more mobile in these hectic moments. Likewise, if your child needs a sleep, they can just crash in a carrier rather than just trying to keep them awake until you board the plane or get through the security queue. If you need another reason to go, know that family holidays have been proven to boost childrens’ brain development so you’re getting long-lasting value from that trip than you may have realised. That’s a whole bunch of extra reasons to plan a holiday with your child in tow. Have fun!